Celebration of 20th Lakeside Festival on Sunday 12th March 2017. We had worked hard over several months to bring together 20 different mainly folk dance groups representing a variety of different cultures that contribute to making Auckland such a vibrant multicultural city to live in. All of us were looking forward to being part of this special Festival celebrating 40 years since the PumpHouse, on the side of Lake Pupuke, was established as a venue for various recreational and cultural activities. It has an open air ampitheatre and an indoor theatre, plus a café run as a commercial enterprise, all set in an idyllic setting in a small park below Killarney Road in Takapuna. However the weather on the weekend of Sunday 12th March was stormy with very heavy rain so the decision was made to hold the festival inside the Pumphouse which seats nearly 200 people. In fact the weather was so wet that Ana –Maria and Thuten Kesang, the President, would not have been surprised if several groups cried off, but in the end only one of the scheduled 20 groups withdrew early and one other a late cry off. It was really heartening to see the performing groups, notable guests and the AMS Committee, plus a great audience not allowing the weather to put them off. Melissa Lee MP, a valued regular supporter of Auckland Multicultural Society functions opened the Festival at the 1.00pm start. Kanwaljit Singh Bakshi MP, also attended the event. Later Michael Wood MP from Mt Roskill delivered a message which let us all feeling very proud of our cultures / heritage and been able to share it with people from many nationalities in this beautiful diverse city of New Zealand. AMS President, Thuten Kesang who has continued to be one of the mainstays of the Society for many years welcomed everybody and introduced the two young guests, MCs Seohui Lee from Korea and Yobithan Yobish from Sri Lanka – Tamil who were confident in their role. 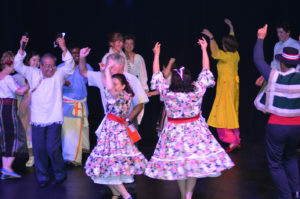 The first performing group were the “Renacer en Auckland Chilean Dancing Ballet” made up of four couples dressed colourfully with the men wearing spurs on their black boots and stamping their feet to the beat of the music. In complete contrast the second group of 30 people called “The Singing Nation” represented the Ukraine and Russia. They sang four songs led by soloist Murina Bloom while the choir leader and piano accordionist Alexander Radchenko led them with gusto. At a slower tempo Sakayana a young man performed several Tamil dances and his movements were graceful and wonderful to watch. This was followed by the “Joy Dancers”, another regular performing group of 6 women dancers dressed in long yellow flowing costumes. All afternoon we were treated to a wide diversity of ethnic and cultural groups, talented dancers, musicians, singers and a storyteller. A regular dance group representing one of the oldest of English dancing was the Maypole Dancers from Meadowbank expertly trained by Rae Storey, a gifted teacher of European folk dance. ….further comments from Rae. The Spanish Fiesta Dancers made up of two couples entertained the audience in their usual elegant and graceful manner using castanets. Following the Fiesta dancers on came the ABBRACIA belly dancers. ABBRACIA means embrace and their graceful movements throughout were expressive and capturing. 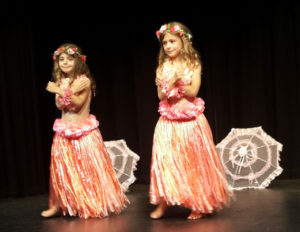 The next performers to delight the audience were two little Italian girls Gretia and Amber Mazza who had been in NZ for three years, but dressed as Polynesians to represent their Kiwi Culture. er performance. 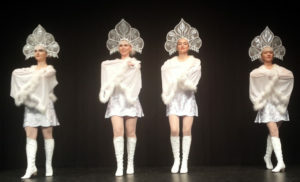 The following three groups were long-time performers at the festival namely “La Bourée” an accomplished group of women dancers led by Rae Storey. amenco from Devonport Richard Aylett and Sandy Schock delighted everybody with their aggressive and competitive Flamenco music. danced a solo and later led a group of the two dancers. “Bulgarian Roses” dressed in their beautiful costumes with black waist coats decorated with gold brocade danced several dances from different regions of their country including Pirrsu, the dance of the Tue Mountains. In complete contrast the next performer, Patrick Bowman was a first time performer at the Lakeside Festival, dressed in Medieval costume he talked about and sang three songs, one of them about wine drinking but in the form of a Latin poem and song. by Irina who danced solo and then as part of small group from the Volga region of Russia. Irina has danced at the Lakeside Festival before and she is a very graceful rhythmic dancer. The Felice Multicultural Fusion from Pakuranga formed in 2015 were made up of seven dancers including two young girls and their dances reflected Polynesian and Indian dance cultures. 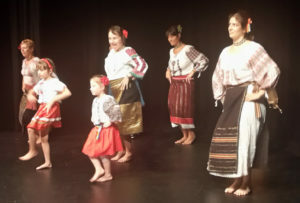 The Doina Romanian Dancers of eight adults and three young girls also performed well. The Auckland Thistle Dancers came from two Scottish Country Dance Clubs, St Heliers and Innis made up of dancers who have regularly supported events organised by the Society. Their dances were varied with interesting patterns and fancy footwork. AGAPE which mean “Happiness” in Russian, performed a snow dance, gypsy dances and their dances were lively and interesting to watch. 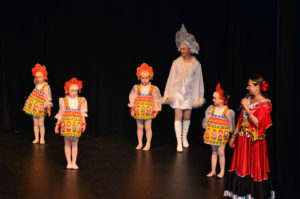 It was delighting to see their five young performances which made very proud their teacher, parents and grand-parents! They are gorgeous. leaving the audience with smiles on their faces having enjoyed 4 hours of cultural music, singing and dances from many countries. AMS President Thuten Kesang closed the 20th Lakeside Multicultural Festival 2017 by thanking everybody for their support and he thanks Ana Maria de Vos Sanchez for the many years organising this event. We are looking forward for our next event, the Multicultural Expo “Traditional toys and games” at the Mt Eden Hall on Sunday 6 August 2017. I was extremely touched by the performances, families and audience because they arrived on time despite of that terrible weather many crossed the bridge which it wasn’t easy with that rain! Thank you, thank you for the support and passion of sharing your culture throughout your dancing, music and singing. You all are my heroes!!! 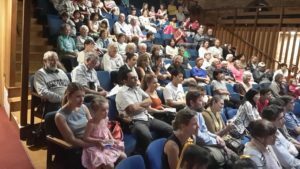 Also I would like to knowledge the Creative Communities NZ (North Shore) for the grant that helped us to cover expenses for the venue, sound system and Koha for the performances. I want to mention that when I sent the invitation to the performances I did not indicate that will be a Koha.